We all know that with quilting that it is measure twice and cut once. Well I usually measure more than twice and then cut but I sometimes still sometimes get it wrong. You would think this lesson would spill over to other things I do. The other day I was in a hurry to iron my dress shirt for upcoming (few minutes away) appointment. I'm rushing around and and hung it on the steam for some last minute steaming the wrinkles out of the shirt. I realize it has static on it and decided to spray static guard all over the shirt. My steamer is in my craft room and I was running around looking for my static guard. Looking in closets, cabinets, etc. Aha, there it is! Cap off and spray, spray, spray. That's funny, what' all that white stuff. 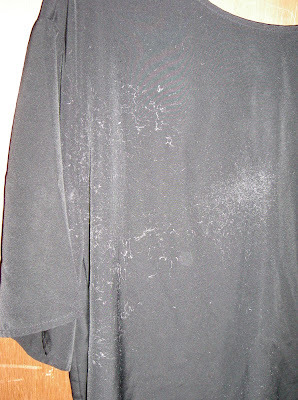 Maybe I didn't shake it well enough like you have to do when using magic sizing or you get all that white stuff. Shake, shake, shake... OK spray again. Hmmm, that's weird. 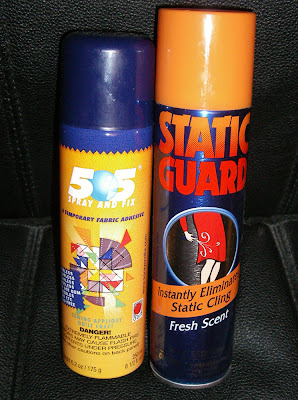 After the second big spray I finally turn the can around to see that it was my can of 505 temporary craft glue spray and not my static guard. UGH,,, Now I need to change my clothes! I couldn't wear the shirt for the meeting but at least it was a temporary. Didn't even dawn on me that the caps were a different color. I just saw blue and orange and just grabbed the can. That's what I get for waiting until the last minute. Lesson learned... never store my static guard in the craft room and look twice before I spray. Hope you have a great day! Oh gosh! Static guard is definitely a life saver (as are the tape lint-roller things!) and I hope your shirt is OK!